Apparently, my niece was not bullish to take the credit. She had taken it upon herself to act as scribe for my 5 year old nephew. 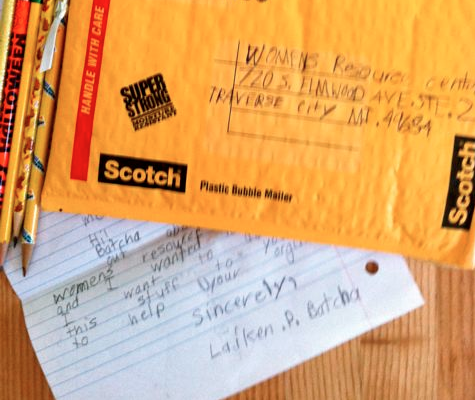 It was, in fact, his desire to send his pencils to the Womens’ Resource Center. Or so she says. While just that bit – seeing kindness for others less fortunate pass through the generations – warms my soul, I am grateful for the acknowledgement that came from the Womens’ Resource Center. So, is this just a cute interaction between a little girl, her brother and a non-profit? I think it’s more fundamental. In new research by the National Center on Citizenship, we learn that in order to build a vibrant and thriving community, we must not only feel attached to our communities but we must also believe that the people in our community care about one another. The Center follows a number of indicators that track social connectedness. These are things like eating dinner together, talking with family and friends online, doing favors for neighbors and attending community meetings about local issues. The list rounds out with indicators such as belonging to organized groups, volunteering and making charitable contributions. I’m sure I wouldn’t score perfectly on all of those indicators but I’m happy to know what they are. These little people would do well on caring for others and making charitable contributions and with time, I know they’ll round out the complete picture. Who says kids don’t copy what their parents model for them? Great job Sierra and Laiken! That is too sweet. Laiken and Sierra are being raised well. Yes, they are. And they will grow up to be good parents too. Yes, it was so great that the center sent a note back! Very nice story. And it reminds me that I need to keep showing my daughter when I donate to the community or volunteer or get involved in community meetings. We do go to Goodwill together to donate piles of her outgrown stuff for other little girls who need it more than she does. I am proud of Sierra and Laiken! Keep showing her Danielle. She’ll follow your lead. Yes, they can but they do model what they’ve seen before. Kudos to Sierra and Laiken. Their gift goes beyond the actual gift of the pencils. It’s the thought, sweetness, and determination to help others that make their gift so special. The fact that the shelter took the time to write a thank you note is incredibly lovely and encouraging to the young pair that they can (and do) make a difference. It’s great that the shelter wrote back. Oh, our wonderful Mirror Neurons . . . allowing us to empathize with others while encouraging us to lend a helping hand. Yay! Great story. Thanks for sharing. Thanks for reading Janis. You’re right. They’re great parents. This is evidence. Fantastic! Seeing this sure made my day! Thanks! Wow, I am so speechless. It is like a North Star of what to shoot for as a mother. Yes, it is. So hold the vision and don’t stress out over the other stuff. Aaaaw, well done Sierra and Laiken, you are really fine girls! You’ll have stories like this to share someday not to far off. magic. thanks for sharing it! Yes, and to share more pencils. My gosh, that’s the sweetest thing ever! 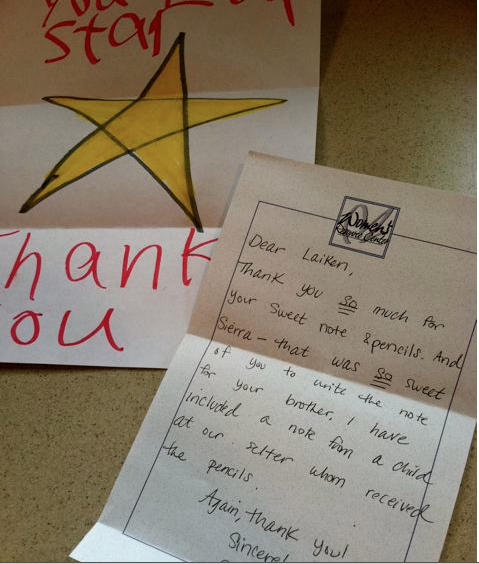 Definitely a reason to be proud, I always love it when children are considerate and give (in their own way). It is the sweetest thing. Absolutely adorable and so thoughtful ! First helping each other with a view of reaching out to others, this is simply wonderful. Yes, I wonder how much of the helping the little brother really occurred but it’s precious nonetheless. Wow! I love it. Was I ever so sweet as a child? We lose so much as we “mature.” The pureness of a child — we should all find it again. I don’t think I was ever as sweet as that. Funny, as an adult, you wonder what the value of a pencil is. But, wait, as a 5-year old, a new penceil (especially when it was sparkly and purple) held all the potential in the world. We should share more pencils (and books, for that matter). It is sweet, isn’t it? This is a wonderful example of how family connectedness can lead to social and civic connectedness. People helping people. People building community. Kids are a key part of this. Everything counts, especially the little things (like pencils). I believe that humanity, generosity and kindness is present more in the little things than in the gifts of vast sums of money. Not dissing money, mind you, but the effort that goes into the little things is often greater than the effort or commitment it takes to write a check. You’re so correct. I sometimes find myself writing a check because I am so busy. Great story…Bless You for sharing. Im proud of them..so very. I have nieces and nephews too and I ardently wish that they grow up to think such. You know what I’m more happy about? That the center wrote back to them. This will strengthen their belief in doing good. Well done Sierra and Laieken. You story is going my nephew and niece today night. Do share Rukmini! Hopefully it will wear off on others. little hearts and hands make such a huge impact on the charitable events. This is precious! what a great letter. I know that you’d send a reply too! What a lovely story! And I love that there came such a reply because it shows the children that they can contribute something and it is appreciated. Silence would have been so encouraging. So yes, for building a community, people have to communicate with each other (duh – but it’s often forgotten!) and be friendly and appreciative. Now the children have learned that activities like this can do something good, and will be motivated to do something for others again. If all people learned that from early age on, and showed their appreciation for each other more, things would be a lot better. And it gives me a lot of hope for the future. I love it! I think these kinds of community involvement are an important part of a child’s education. I agree. Obviously they had seen this behavior before and took it upon themselves to mimic. So TRUE to my personal feelings. I simply can’t understand why people isolate themseves into a little bubble and don’t seem to care about what’s going on in the world around them. They can’t see the connection about how issues can affect them and their children until it’s too late. We’ve become a REACTIVE society instead of a PROACTIVE society, and that drives me crazy. “to build a vibrant and thriving community, we must not only feel attached to our communities but we must also believe that the people in our community care about one another.” ABSOLUTELY!!!! Good point on the reactiveness vs. being proactive. This is so inspirational, Tammy. We adults feeling the innocence of a child’s love and connection. I am thinking about the different kinds of communities right now. The way our blogging community supports one another… We live in a hologram of communities, don’t we? Hologram is an interesting way to describe it Kathy. It touches mine too Kathleen. Blessings back at you. This is a great story. 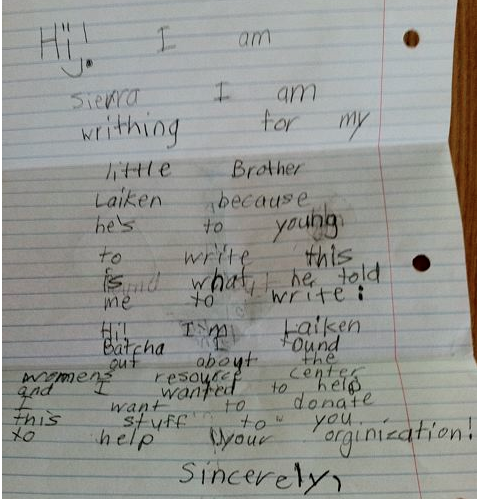 I love the letter Sierra wrote. This honestly warmed my heart. I’ve been trying to find local community where I live here in Los Angeles. While I’ve found niches of groups and subcultures (which is great), I think in the end what I’m really looking for is a living neighborhood community that hits all those points the Center mentioned about social connectedness. What a great idea – to turn it into a poem. Good neighborhoods are hard to find billimarie. Even though I think mine is quite good, I just found out about an elderly man down the street with no food and no electricity. Needless to say, I’m on it but it truly takes a village. Thanks for sharing. This is simply beautiful and says volumes about the parents. This actually brought a tear into my eyes. Shows how much more caring and wise children can be than most of us adults. Yep, we all start out pretty innocent. A lesson we can all learn from. These kids have a genuine heart that wants to give in their sweet little way. So adorable. Love their writing too. Beautiful. Stay blessed always. And you. Thanks for the visit. Thanks again for another inspirational story from the next generation. It is inspiring isn’t it Camille? There is hope for a brighter future. In spite of many comments, Tammy, I just have to say this is where the whole world needs to be. I am so touched by these children. If we see youth leap frogging over us in the care department, we have facilitated the essentials. I agree with you 100% Amy! This is what matters.